Welcome to Day 12, the first of three days on Managing Finance. Don’t groan! (I’m talking to the right brained amongst you now, who probably would like to get on with being creative and building relationships!) You wouldn’t expect a Making Money Challenge not to address managing finance would you? I know from most of the courses I run that financial planning is something that doesn’t come easily to everyone so I’ve broken it into three steps that build on the work you’ve already done on Days 6 and 8. Today we’re looking at budgets, tomorrow at raising finance and on day 14 planning cashflow. I’m sure that I don’t need to tell you how easy it is to spend money! Holding on to it is much more difficult. Budgeting for your income and expenditure introduces a bit of discipline and control. It helps with decision making too, when you know how much you have available it is much easier to decide whether or not to buy. Typically in a business you would set an annual budget but for this challenge you might want to set a budget specifically for the activities and duration of the challenge. What you are doing is working out how much you will have to sell and how much you will have to spend to achieve the amount of money you have set as your goal. If you worked out your break even on Day 6 you probably have most of the figures you need already, we just need to map them into a budget and then check that they make sense. Here’s a template to allow you to do just that. 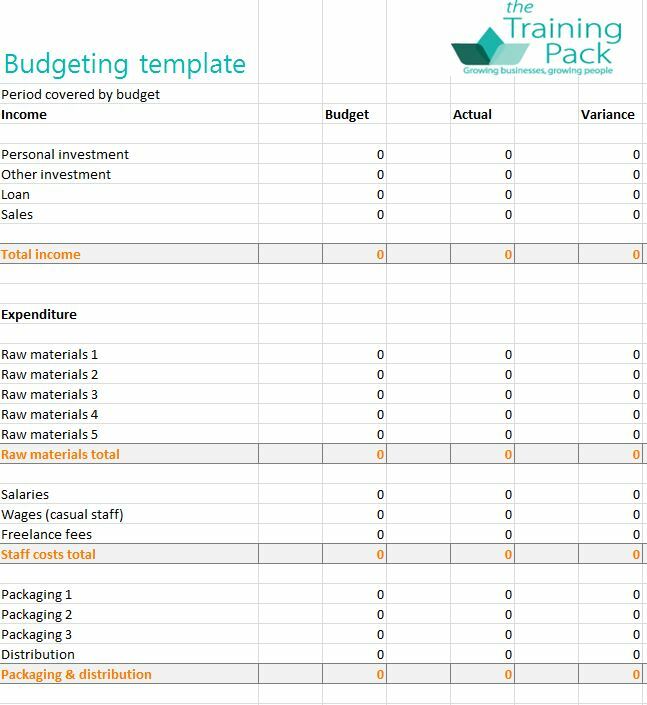 This is an Excel template so if you have any difficulties downloading it please contact me via the comments section below or in the Facebook group. The template is editable but if you add extra rows you may need to redo some of the formulae to ensure get the right totals. You will see that I have numbered certain items where you may have more than one expense e.g. raw materials. I suggest you change these so that they reflect what you need to spend money on. Enter these figures in the budget column. Once a week, or once a month if that is more practicable, add your actual income and expenditure into the actual column. The variance column should calculate the differences automatically, allowing you to see where you need to sell more or cut down expenditure. If you worked out your break even point on day 6 it should be relatively easy to work out how much you need to sell to achieve your money making target. Of course we didn’t factor in overheads such as administration and marketing into these calculations so you may find you need to sell more to cover these costs in order to make your target. Remember that if you need to sell more your direct and variable costs are likely to increase too. You can use the template for any period you choose. One budget to cover the period until your deadline for making the money may be enough because we’ll be working out a monthly cashflow forecast on day 14 but you could do a monthly budget if you feel it would help you. When you have put in all the figures does your budget total equal the money making target you set yourself? If not what do you need to increase or decrease? Is this realistic? If not, what needs to change? ACTION: Complete the budgeting template and check that you are on track to make your money making target. I’ll ‘see’ you tomorrow when we work out your options for raising any finance you need. Happy number crunching! Join us tomorrow to when we’ll be looking at how to raise finance.